You may have noticed: growlers are having a moment right now. DC Brau and Chocolate City Beer are filling them on weekends. Council members are introducing pro-growler legislation. 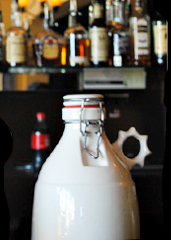 What you need: a growler worthy of this historical epoch. Like something from Portland Growler Co., now here to provide you with stone-cast growlers from the home of quirky sketch comedies, centrist senators and copious amounts of coffee. Yes, we mean Oregon. This is the kind of throwback, cast-stone vessel that might have sustained Steinbeck as he traveled the country with Charley. The work of a team of enterprising ceramicists (we didn’t know that was a word either) who turned their attention to beer, these are more durable than glass, and they’ll keep your beer colder, too. When you place your order, they’ll get to work hand-shaping and casting your growler according to your exact specifications of color, glaze, and round or sprocket-shaped handle (call it a spur, if you must). Once it arrives, your job is pretty simple. Fill it. Wash it. Fill it again. Of course, should you want to make your prized possession a little more individualistic, they’re happy to throw a carefully chosen witticism or logo onto the bottle. Finally, a worthy home for your family coat of arms.